I was taking my dry washing off the rotary line the other day as my cleaner arrived. “Is that underwear?” she cried, appalled. At first I thought she was querying whether a particular item of clothing was actually underwear, because she thought that the knickers were so large they must really be shorts. Or maybe even trousers. But then I realised that her horror was rooted in the fact that I would dare to hang my family’s underwear on a washing line to dry, where others might see it. Not underwear, because that would be outrageous. Unfortunately for my cleaner, the local reliance on electricity to dry washing, despite the presence of almost perpetual sunshine, gets my goat. 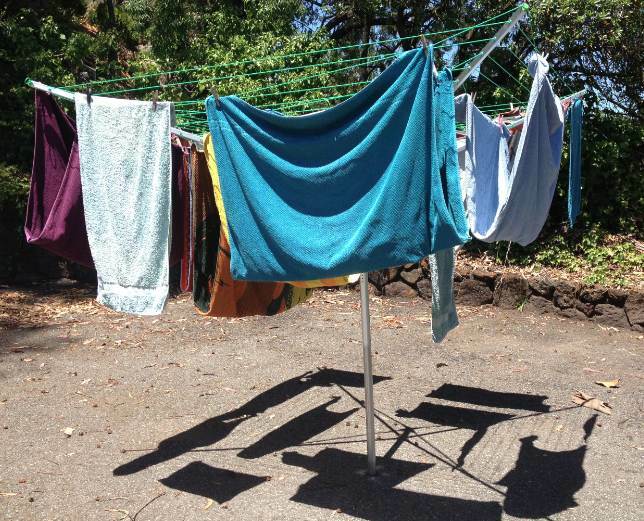 I pointed out to her that it’s much more environmentally friendly to dry washing in the sun; not to mention that it smells fresher and is significantly cheaper (and electricity bills here are at least five times what we paid in Britain, so that’s a cost worth saving!). She argued that it’s easy for me because I have space for a rotary line; but that’s a cop-out because I also have a collapsible clothes-horse for rainy days, and anyone can have one of those. It’s thought that power plants and related electricity generation operations produce up to 36% of the total of US greenhouse gas emissions. People here haven’t thought this through. The Bay Area is so environmentally conscious, so hot on recycling, so keen to provide compostable consumables instead of plastic, that it doesn’t make sense for its inhabitants to use a tumble drier when the sun can dry wet washing in a couple of hours. Why use electricity when the sun can do the job? My cleaner is too busy or too easily embarrassed to hang her washing outside, and she uses shocked horror to defend her stance. I think it’s sad that people would rather be outraged by underwear on display than by the negligent and wasteful use of electricity. 3 Responses to Is that underwear? maybe it is the state of her underwear? Rock on sister , wished I’d been I fly on the line listening to that one Nat !! The solar panels chap I was talking to (who actively advocates harnessing the sun’s energy) uses a tumble drier too! Madness.